Time is flying by. I am officially 4 1/2 months today which means I am half-way through my pregnancy. That kind of freaks me out. But it also kind of makes me super duper excited! Your baby's ears are now facing forward and are completely formed so she can actually hear you talking now. You don't need to abandon your potty mouth just yet, but you might want to start thinking about it! This week is also the beginning of ossification. And while that sounds like some long and involved paperwork you'll have to fill out, it's really a fancy medical term for the hardening of your baby's miniature bones. And that's a good thing.Your baby's nerves are making more and more complex connections. Her sense of smell, taste, sight and hearing are all developing. A substance called myelin, which makes nerve connections travel faster, is now coating your baby's nerves. Seriously? Gross. 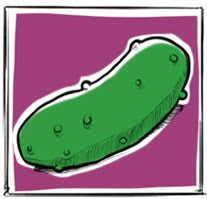 If you know me, you know I am NOT a pickle fan. Well this is not much better actually. Couldn't they find a better picture of a sweet potato? this looks gross too. Hahaha... I KNEW it! Maybe this is a sign you should stop hating pickles. P.S. 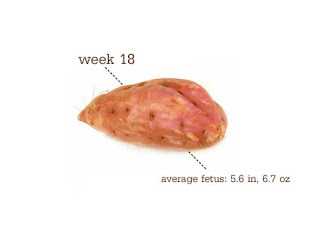 That IS a nasty sweet potato.